Introduction: Vascular inflow control in laparoscopic liver resections can reduce blood loss and transfusion rates. Selective clamping, in contrast to hepatic pedicle clamping, does not cause ischemic injury to the remnant liver and may be particularly efficient in laparoscopy. 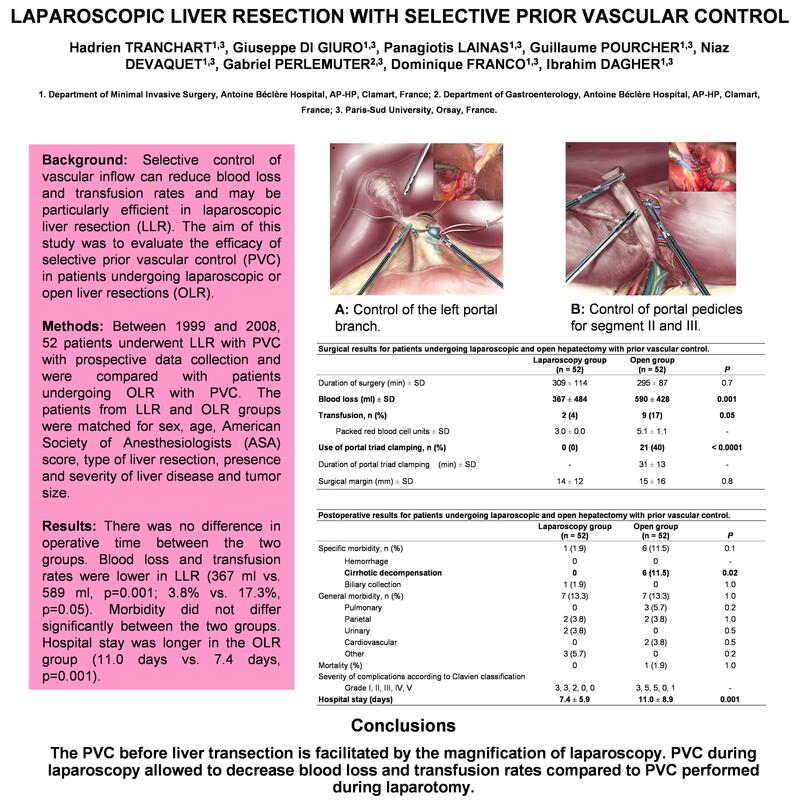 The aim of our study was to evaluate the effect of selective prior vascular control (PVC) in patients undergoing laparoscopic liver resections (LLR). Methods and procedures: Between 1999 and 2008, anatomic LLRs were performed with PVC whenever possible. Fifty-two patients underwent LLR with PVC with prospective data collection and were compared with patients undergoing open liver resections (OLR) with PVC selected from our liver resection database, in a case-match analysis. Variables evaluated were: duration of intervention, blood loss, transfusion rate, resection margin, specific and overall morbidity, perioperative mortality and length of hospital stay. Results: There was no difference in operative time between the two groups (309 min vs. 295 min in the laparoscopy and laparotomy groups, respectively; p=0.75). Blood loss and transfusion rates were lower in LLR (367 ml vs. 589 ml, p=0.001; transfusions: 3.8% vs. 17.3%, p=0.05). Surgical margins were similar. Specific and general morbidity did not differ significantly between the two groups (specific: 1.9% vs. 11.5%, p=0.11 and general: 13.3% vs. 13.3% in LLR and OLR, respectively; p=1.00). Hospital stay was longer in the OLR group (11.0 days vs. 7.4 days, p=0.001). Conclusions: PVC during LLR was feasible and improved intra-operative and post-operative results when compared to OLR. Selective PVC should be obtained in LLR whenever possible.